Unprecedented. Unheard of. Unthinkable. Oh, and most of all, just absolutely ridiculous. 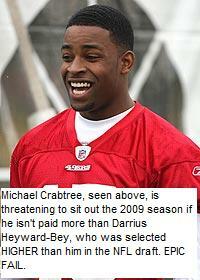 Sure, Crabtree might be a better wide receiver, but he was still drafted lower. Oh, and guess what his cousin has to say about Crabtree sitting out the entire season: “We are prepared to do it. Michael just wants fair market value. Michael is one of the best players in the draft, and he just wants to be paid like one of the best players.” Who is this guy? I mean, it’s one thing if his agent comes out and says this, but his cousin? Give me a break! We here at The North End Zone think he deserves jackass of the week, if not the entire year. I mean, really, who bases their pay on a mock draft? You are currently browsing the archives for the Holdout category.